Whilst I like a half marathon, they don’t like me. Inevitably, something interferes with my training. Folkestone 2011? My ITB decided to play up. Royal Parks 2012? Dodgy back. Blackpool 2013? Found out that I’m pregnant. Yup. It turns out that there were actually two of us completing the last couple of weeks of Janathon (I wonder if this gets me restrospective bonus points on the table of death?) and whilst I’ve been running (and have reacquainted myself with the gym) since getting the blessing off the midwife, I have been doing what feels comfortable rather than Serious Training (not that I ever do that much of that). 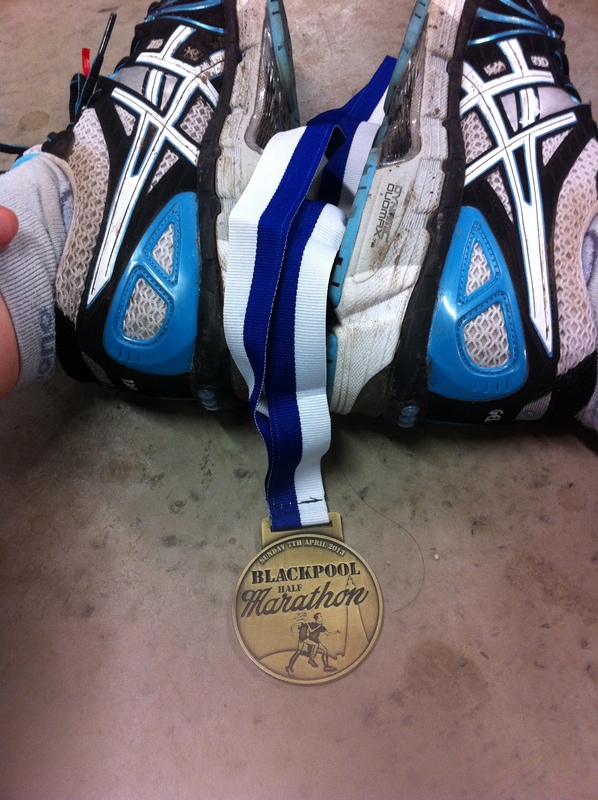 I’ve had races booked in since January (the moral of this story, don’t try to plan ahead – the gods will mock you) and have done two of the 10k’s that I had planned, but Blackpool was a different matter. I was inspired by the woman who set off (and I suspect finished) in front of me at the Royal Parks Half wearing a five months baby on board sign, but could I do the same? I did what has become my standard research procedure (googling whatever I want to know about + pregnant…) mostly to find uber-fit running moms (they were mostly American) who looked slimmer at 20 weeks pregnant than I did before I was pregnant. This did not fill me full of confidence. The Monday before race day, I started coming down with a bit of a snuffle. As the week went on, I became more and more snot-filled before it moved on to my chest and by Friday, I was doubting whether I would even make it to the start line. When I packed my bag on Saturday I was feeling better but still I packed for running and not running (just in case). After I checked in at the incredibly lovely and friendly New Bond Hotel, I met up with Ian aka runningman856 (who was my designated responsible adult), collected our race numbers, went for a pint (of blackcurrant in my case) and then went carb-loading at a rather nice little Thai restaurant (where I think the chillis helped clear my lurgy). I went to bed with everything crossed that I would wake up feeling well enough to run. Sunday morning came, I took a deep breath…and didn’t cough, rattle or wheeze. I could breathe and felt as human as you can do at half six in the morning when you know there’s a 13 mile run in the offing. After collecting a somewhat grumpy Ian from his hotel (apparently someone didn’t have a good a night’s sleep as I did…), we mooched down the front to meet Carla*(aka Fortnight Flo) who had ventured up north with her somewhat bonkers mates from Stopsley Striders. I had pre-warned Carla about me having a bun in the oven and she had very kindly offered to run with me doing 11.30/12 minute miles. Perfect. There was a somewhat chaotic start to the race and Miles didn’t manage to get a signal until about a third of a mile into the race, but it wasn’t long until we were heading south down the promenade, inhaling the smell of doughnuts, eyeing up the roller coasters and pondering on the health and safety issues involved with staging burlesque on ice. I’m not used to running with company anymore, but running with Carla and Christa was an absolute joy and I don’t think I stopped grinning for at least the first five miles (their performance of Staying Alive as we ran past a giant glitterball was simply amazing). The route is traffic-free and took us along either on the closed prom or the pedestrian-only sea front. The sea front nearly did for me. At first, it’s very nice running right beside the sea, but soon the endless sight of sea-to-the-left, sea-wall-to-the-right became somewhat dull. I say somewhat dull, if it wasn’t for Carla’s company and encouragement, I think I would have found a reason to give up at this point. Luckily, the turn-around took us back up into civilisation and gave us plenty of landmarks to keep us going. When we passed the hotel where I stay during Janathon, I knew that I really was on the home stretch and convinced myself that because I had run the route before, I could certainly do it again (although I haven’t usually run 10 miles when I set off from there). Soon we were passing North Pier and the tower was looming closer into view. I’d already clocked the 12 mile marker the day before and knew exactly which shop it was in front of – never in my life have I been so pleased to see a Poundland… By this time, it was midday and the prom was much more filled with holiday makers and bleary-eyed stag do’s (some of who gave encouraging cheers and applause to the idiot runners) and I found it much easier than the previous quiet stretch. Coming into Bloomfield Road for a stadium finish, I couldn’t see Carla for dust as she pulled an amazing sprint-finish out of the bag and I came in slighty behind her in a not too shabby 2 hours 39 minutes 05 seconds on my chip time (about ten minutes slower than my previous half results). Ian did his duty by handing me my bottle of chocolate milk and I collected my bling and goodie bag, before we collapsed onto the refreshingly cold concrete floor (to get up, I had to use the technique that I used to teach to older people who had fallen…). My ankles and right hip were complaining bitterly yesterday afternoon and I swore every time I had to go up or down a kerb (luckily this has now passed and I have been left with the normal post-race sore quads). I’d stuck to my my basic rules – stay hydrated (carrying water between stations rather than taking a swig and chucking the bottle away), listen to my body (and hearing only the usual whinging from it) and don’t do anything bloody stupid. Could I have done it without the support that I had from Ginge (whose encouragement gave me the confidence to even consider the whole enterprise) and my on the day Athoner friends? Probably not. I really can’t say enough about how Carla’s pacing and company lifted me through the race – I would highly recommend her if anyone needs a running buddy! I am also reassured that by the end of Sunday afternoon, I was already thinking about when I might do it all again – Autumn half in 2014 anyone? YAY!! I am very excited for you both. And more in awe of you as a runner! Congratulations twicw over. I ran up until about 20 weeks (it then became too uncomfortable) but cont. With the gym throughout. Swimming is lovely when you get bigger. Enjoy. ‘spect! You did it! I did wonder if you would take to the side lines, I am very impressed 🙂 All that Janathoning with a little one in tow, you certainly get bumped (sorry) up to the top of the table. My knitting needles are clicking away. Congratulations! Brilliant news. Sounds like a good run too, well done. Congratulations! And well done on completing the half marathon. I couldn’t have done that within my first 12 weeks. I did feel better during the second trimester though, and ran up to 28 weeks. I’m 36 now and feel just about ready to pop. Official congrats to you and Ginge! I thoroughly enjoyed running with you too. Cardiff 2014??? What a great race report. I can never remember more than, “I started, I ran, I finished” but that was lovely. And many congratulations on baby news! !